At the heart of the scientific community of Montpellier and the Occitanie area lies a comprehensive training system in the subjects of agriculture, food, biodiversity and the environment, provided by higher education and research institutions that are members of Agropolis International. A comprehensive higher education system to meet the needs of students and professionals with a large range of levels, themes and career prospects. Courses listed by admission level, degree, theme. A set of continuing courses for professionals, open to international students include sessions that can be attended either in Montpellier or in Southern countries. Founded in 2005 at French initiative, the international network FAR assembles stakeholders involved in vocational training systems aimed at rural development in Southern countries. Its issues are related to professional training of rural population in order to fight against poverty and hunger. 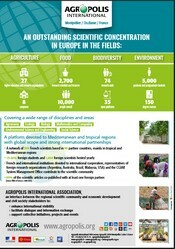 Agropolis International hosts the headquarters of the International Network in rural and agricultural training. In partnership with the FAR network, Agropolis published an electronic library on rural and agricultural courses and on training system engineering (2005-2011). Founded in 1981 by some members of the GCRAI (Consultative Group on International Agricultural Research) ICRA aims to stimulate rural innovation in the South by strengthening the abilities of people and organisations in research, education and development. It has also evolved from mainly core programmes in Wageningen and Montpellier to more tailor-made in-country programmes, in collaboration with international partner education and R&D organizations. ICRA’s headoffice and english program are hosted by Wageningen International (Netherlands .The French program is hosted by Montpellier SupAgro - Institut des Régions Chaudes on the Agropolis Campus. The Euraxess Services Centre in Languedoc-Roussillon, managed since 2004 by Agropolis International, has been transferred to the “International Office” of COMUE LRU in Montpellier, as from 27th February, 2017.